Noritake celebrated its 100 year anniversary in January of 2004. Baron Morimura was born into a merchant family in 1839 who acted as purveyors to the Tokugawa Feudal Shogunate Governing Lords 1603 - 1868 and more. At the Age of 20 he joined a high level delegation to the US after for reciprcial trade negotiations in 1859 after the visit by Commodore Perry in 1852 to Japan. 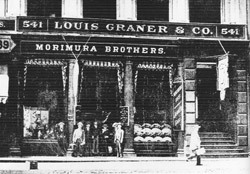 In 1876 'the founder' Baron Ichizaemon Morimura founded 'Morimura Bros Inc.', not long after Japan opened its doors to the world (end of the Feudal Sogunate Governing Lords 1868), and established export office in Toyko and a retail and wholesale office in New York trading as 'Morimura Brothers Co'. With his astute business acumen he realised that the American market was positioned to receive imports of Japanese porcelain. The range of products imported during this period to the U.S.A., were china, gifts and other decorative products sourced from independent factories around Nagoya. In order to ensure that his exports were of the highest quality, 'the founder' recognised the need to control production. In 1904 he established the 'Nippon Toki Gomei Kaisha' (the forerunner of the present Noritake Co., Limited) and the first factory was constructed in the then small village town of Noritake, Nagoya, Japan. Six years later, in 1910, the first china products from the new company, called Nippon Toki Kaisha, left Japan for the U.S.A. market. The mark used on these wares was the 'M' (standing for Morimura) in the wreath (and was also the crest of the Morimura Family) with the words Hand Painted Nippon. This early period of porcelain production was known as the NIPPON ERA 1968 to 1921. This coincided with the reign of 2 Japanese Emperor's Meiji - 1868 - 1912 and Taisho - 1913 - 1926. It advanced duties ad valorem on a considerable number of commodities, both raw materials and manufactured articles. All foreign goods imported into the USA be marked with the country of origin in English. Japan decided on the use of the name 'Nippon,' as the translated work to english for Japan. In 1921 the USA, deemed the use of the word 'Nippon' unacceptable and required the country of origin name to be 'Japan'. In 1941 the export offices were closed and the 'M' was changed to an 'N' for Noritake post WW2 Japan. However some pieces with the letter 'M' were produced till around 1953. There is believed to be more than 400 variations of back marks used on products associated with Noritake which include the founding companies of the Moriumura Brothers. In 1981 the company changed its name to Noritake Co., Ltd. The Noritake Company still holds true to the Philosophy set out by Ichizaemon Morimura VI in 1919. The timeline chart below maps the progress of the Noritake Company from its beingings to present day. with written consent of Noritake (Australia) Pty Ltd.
Morimura Ichitaro (Later Ichizaemon VI) and his brother Toyo founded "Morimura Gumi" at Ginza 4-chome, Tokyo. On March 10, Toyo sailed from Yokohama for America in December, Toyo, Sato Momotaro and Date Chushichi established the retail store "Hinode Shokai" in a partnership at 6th Street, New York. Nitto Yoko, established in Semarang. Nitto Yoko, established in Soerabaja. Morimura Bros. (U.S.A.), Inc. established in New York and Los Angeles Branch opened. Changed the Company name to Noritake Co., Ltd.
Morimura Bros. (Europe) B.V. established in The Netherlands. Established Noritake Hong Kong Ltd.
Morimura Bros Inc. - Chettinad MB-F Hi Silica Pvt., Ltd. established in India. Established Noritake Singapore Pte. Ltd.
Shunsuke Morimura appointed President of Morimura Bros Inc.
Hong Kong Liaison Office opened Morimura Bros Inc..
Morimura Bros., (Singapore) Pte. Ltd. established. Established Noritake Dental Supply Co., Ltd.
Onoda Morimura Magnesium Ltd. established in Toki Morimura Bros Inc.. Assumed full control of Morimura Bardiche from BASF, and restructured the company as a wholly-owned subsidiary under the new name, Morimura Chemical Ltd.
Morimura Bros Inc., Assumed full control of Besho Plastic Co., Ltd. from Bakelite Shoji Co., Ltd. (Company name retained). Morimura Bros., (H.K.) Ltd. established in Hong Kong. Established Noritake Gypsum Co., Ltd. Established Noritake Bonded Abrasives Co., Ltd.
2002 Yusuke Morimura appointed President. Moralco Limited shall merge with Alcoa Kasei Limited and change the name of company to Alcoa Chemicals Japan Limited.�iPresently Almatis Ltd.
2003 Morimura Bros., (Shanghai) Co., Ltd. established in China.